QED XTC Pre-Packaged Airloc Terminated Speaker Cables. 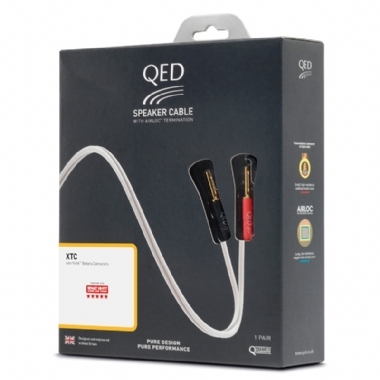 Terminated with QED Airloc 4mm banana plugs and available in 2m, 3m, or 5m boxed pairs of speaker cable. XTC utilizes the same technology as Silver Anniversary X-Tube but with the removal of the silver plating and extra wide conductor spacing it aims at a warmer and rounder sound compared to its more expensive sibling.